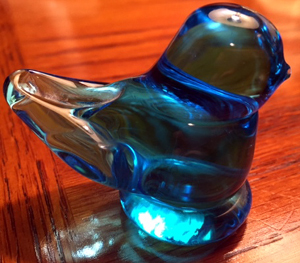 Over 25 years ago, I received a glass “Bluebird of Happiness” from a woman who I helped figure out a new regulation that impacted her family business. She was very grateful and took the time to not only mail me a thank you note but the beautiful glass bluebird. I still have it and remember what it meant then and now. We will either be remembered most for what we took or what we gave. And as we take more, we soon realize that it will never be enough to fill our cup. When we give more, we discover the gift of giving that overflows and returns to us again and again. When gratitude takes hold, the only option we have is to share it. Foster gratitude within so you can cast gratitude and light into the world. Beautiful mantras to carry forward …. Be a giver and the gratitude multiplies. Gratitude is Grace. When I find myself heaped in negativity I remember to refocus on gratitude for my life…..pieces and the entirety. And I am extracted magically from my self imposed pit. Beautiful post. Beautiful – gratitude IS grace! We do dig our own pits and we can get out of them too. Thanks.